There are many reasons why we recommend using a crate in puppy training, but it must be done correctly in order to be effective. Incorrect use of a crate can be counterproductive at best and cruel at worst. Crate training keeps your puppy — and your belongings — safe and allows you to control the puppy during times when you can’t pay attention to everything the puppy is doing. This helps all other aspects of training, but particularly housebreaking. It helps that, in the wild, dogs are den dwellers. They like a space big enough to turn around and curl up for sleep, and it’s useful to know that den dwellers won’t usually soil in their sleeping area unless there is no other choice. So if your pup is well exercised and had time to use the bathroom outside, the crate can become a welcome spot — his or her own “den” in the house. Toward this end, we recommend: providing some sort of chew toy such as a Kong for distraction, keeping the crate near you when the dog is crated and you are home (but interacting as little as possible), feeding in the crate, providing a soft bed once the dog is housebroken, providing an item that has a family member’s scent on it and hiding treats in the crate. It is important for you to ignore whining and barking that is not the dog asking to go outside and eliminate. Any response to this behavior will make it continue because the dog is getting what it wants: your attention. However, if a crated dog is asking to go outside to use the bathroom, you should take the dog out and reward this behavior. It’s also important to crate your dog for short periods during times when you are home so that the dog doesn’t associate the crate with your departure. Follow these guidelines and, over time, the dog will see the crate as a welcome spot. In fact, most crated dogs sleep in their crate even with the door open. The most important thing to remember is that the crate cannot be used for punishment and that you, as the one in control, must be aware of your dog’s needs, even to the point of anticipating them, to avoid accidents and misuse of the crate. Do think of the crate as a good thing. In time, your dog will too. Do let the dog out often enough so that it is never forced to soil the crate. Do let the dog out if it whines because it needs to eliminate. If you know it doesn’t have to eliminate, ignore its whining or barking. Do clean out the crate regularly, especially if you’ve put in a floor and you have flea problems. Don’t punish the dog if it soils the crate. It is miserable enough and probably had no choice. Don’t use the crate as a punishment. 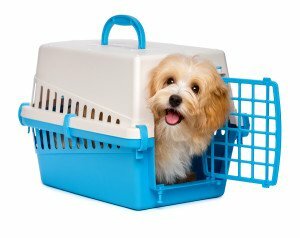 Don’t leave the dog in the crate for a long time after letting it eat and drink a lot because the dog will be uncomfortable and may have to eliminate in the crate. Don’t leave the dog in the crate too much. Dogs sleep and rest a lot, but not all the time. They need play time and exercise. When you are at home, they should not be in the crate (except at night when they are still very young puppies). If necessary, put a leash on your pup and tie it around your waist while you’re at home. Don’t check to see if your dog is trustworthy in the house (unsupervised, outside of the crate) by letting the dog out of the crate for a long time. Start with very short periods and work your way up to longer periods. Don’t ever let the dog grow unaccustomed to the crate. An occasional stint even for the best behaved dog will make traveling and special situations that require crating easier. Copyright © 2017 Tropical Dog Training. All Rights Reserved.